OBSERVE AND FIGHT: WHAT DOES BOB ARUM KNOW THAT WE DON'T? It's Monday. Welcome back for another edition of Observe and Fight, The Boxing Observer's compilation of observations and random thoughts from the week that was in boxing. Get caught up on some of the most recent events you may have missed out on, including Bob Arum's secret, episode two of Pacquiao-Marquez 24/7, Nonito Donaire's incentive for his next fight, and much more. Without further ado, check out the latest observations from The Boxing Observer. 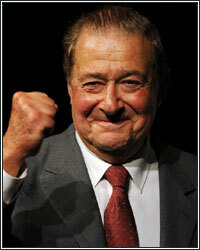 What does Bob Arum know that we don't? I am by no means accusing anyone of using steroids or performance-enhancing drugs, but does anyone else find it odd that Manny Pacquiao fired VisionQwest allegedly under the advisement of Bob Arum? This is AFTER he hired them to check into his financial records to see if Top Rank was screwing him over for money owed. What about Nonito Donaire? I like Donaire and think he is a super-cool dude, but what the hell really happened with his contractual situation? If he really wanted to leave for Golden Boy, he could have figured it out. Nonito now trains with BALCO mastermind Victor Conte. You do the math. Is Arum holding his fighters hostage with privileged information? I'm not sayin'...I'm just sayin'. Speaking of Nonito Donaire. How great is it that Top Rank president Todd duBoef is offering a $100,000 winner-take-all bonus for Donaire's next fight? So long Omar Narvaez, hello Rocky Balboa! They say boxing is a business-first sport and this is business smart. Top Rank continues to be innovative in its thinking, which is why they are the leading promotional company in boxing. Well-done Mr. Arum! Pacquiao-Marquez III, the fight better be better than 24/7. For every one of you who believes the writers at FightHype are on the Mayweather payroll, answer me this question, who would you rather watch in the lead-up to a fight...Mayweather or Pacquiao? 90% of you will say Mayweather, and the other 10% are lying. I actually stopped watching this week's episode of Pacquiao-Marquez 24/7 in the middle and watched the rest of it Sunday morning out of sheer boredom. Did anyone learn anything new about either fighter...other than JMM doesn't drink his own pee anymore? YAWN! Wake me up November 12th. Timothy Bradley will be Manny Pacquiao's next opponent, but Pacquiao will NOT be Bradley's next opponent. Earlier this week, Bob Arum said Bradley has not been guaranteed as Pacquiao's next opponent. Bradley echoed Arum's sentiments. I certainly believe it. Pacquiao isn't likely to return until May of 2012. That leaves Bradley plenty of time to beat Casamayor, and then build his name on an HBO main event against someone like Mike Alvarado or Mike Jones. It makes sense to build Bradley just a bit more. Yuriorkis Gamboa may have made the smartest (or dumbest) move of his career this week. If you haven't heard, Gamboa hired hall-of-fame trainer Emanuel Steward to be his new coach. Gamboa's style is very fan-pleasing, but he has a tendency to get touched up a bit too much. While it hasn't hurt him yet, it will as he moves up in weight. Enter Steward, who has turned Wladimir Klitschko and countless others into defense-first fighters who make it difficult to hit. If Steward can somehow teach Gamboa superior defensive skills while keeping his unprecedented aggressiveness, Gamboa could be unstoppable. However, if he takes away Gamboa's mojo, it could be the next coming of the brutal tandem of Zab Judah and Pernell Whitaker. I'm glad the Alfredo Angulo vs. Vanes Martirosyan fight didn't come to fruition for this Saturday. The little boxing that was on this weekend featured Martirosyan in an easy unanimous decision victory over Richard Gutierrez. In the fight, Vanes looked good, but showed me nothing in terms of keeping up with the pressure Angulo would put on him. Let's just say we should all be glad he over-priced himself allowing James Kirkland to step in. It was a slow week in boxing, and much needed considering the excellent lineup to close out the year. It starts this Saturday night with an HBO/Showtime double-header featuring Angulo vs. James Kirkland & Lucian Bute vs. Glen Johnson. It ends with a fantastic, action-packed main event on New Year's Eve between light heavyweight champion Tavoris Cloud vs. Zsolt Erdei. In the middle is Pacquiao-Marquez III, Agbeko-Mares II, Cotto-Margarito II, Ward-Froch, Julio Cesar Chavez Jr., "Canelo" Alvarez, Adrien Broner, Gary Russell Jr., Chris Arreola (Saturday on ESPN Deportes), Austin Trout, Timothy Bradley, Amir Khan, Wladimir Klitschko, Roy Jones Jr. (laughable), and Jermain Taylor. Like T.O. said, "Get your popcorn ready." I'm tired of fighters calling out other fighters with no credentials to back it up! If you can beat the guy at the top, prove it in the ring by beating the guy in the middle first. Gotta crawl before you can walk, and some of these guys are trying to sprint before coming out of the womb. It takes time gentlemen. Not to say, some of you don't have the talent or ability to be superstars because some of you do have what it takes, but show us something in the ring against a quaility opponent first and quit trying to earn a quick payday. You hear me David Haye, Ismayl Sillakh, Nathan Cleverly, Peter Quillin, Dmitry Pirog, Anthony Mundine, Kell Brook! Send your comments to dkassel@fighthype.com, "Like" The Boxing Observer on Facebook, and follow me on Twitter @BoxingObserver.